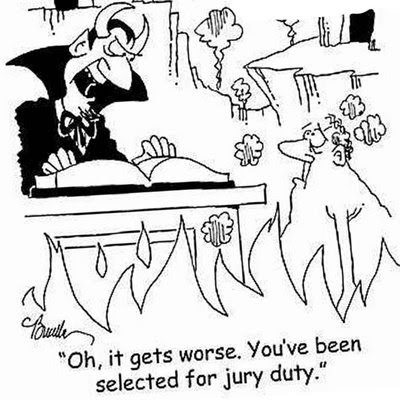 Kat's 9 Lives: Jury Duty! In the short time that I have been eligible to do Jury Duty, I have done it 4 times! 2x I went to the courthouse and 2x on the phone. It is interesting how they have changed the selection process or it could be that I was at the Central Court and they have a different selection process. If I got on a trial, it might have been fun. Let's just say you would not want me as a juror on your trial nor would I even want myself on it. O=9 I'm the character thinking, "Guilty, Guilty, Guilty!" lol In my mind for the particular case I was on, you are guilty until proven innocent especially since there are repeat felonies. If you are innocent then you have nothing to fear and your innocence will be cleared. I understand that the law says you are innocent until proven guilty. Of course I would try to think that way but we all have our own thoughts that seep into judging others. So I had to be honest that I can only try to be impartial. I am not going to lie and give the man an unfair trial. Needless to say the Defense Attorney excused me first. O=P Smart move! If he didn't I would think he is a horrible lawyer. The whole day of service was long and tedious, but it was interesting to see the process. Being on the bench is like being on trial since the lawyers are judging you. I must say some of the jurors themselves have a long history too! One guy had 2 DUI's and another was convicted of a Misdemeanor... hmmmm... Oh well, I am outta there and I don't plan to go back within a year! Woot Woot!